If you are unable to plant your irises right away store them in a cool dry place. The sooner the irises are planted, the more likely they will perform well for you the following spring. PLANT your irises in a sunny, well-drained location (at least one half day of sun). Too much shade will produce heavy foliage, but little or no bloom. Soil pH should be close to neutral – add lime to sweeten very acid soils. Don’t plant iris too deeply; just barely cover the rhizome with earth. Firm soil tightly around each rhizome. For heavier, clay type soils, add aged compost, course sand and/or gypsum to the soil when preparing the bed, and plant irises in raised beds. Plant from one to two feet apart. For immediate effect plant closer, or plant three roots of a kind in a circle for a clump effect next season. When planting during very hot weather, it may be beneficial to shade the iris for a couple of days. Bearded irises do not like “wet feet”. When newly planted they will require weekly watering until the roots are established. After that, or in established clumps, infrequent but deep watering is best. Keep irises free of weeds and don’t allow other plants to shade or unduly restrict air movement around the irises. Winter protection is not necessary in milder climates, but in colder sections of the country, a winter mulch of bark, pine boughs, or straw should be applied after the first frost. REMOVE COVERING when growth starts, early in the spring. Do not cut back iris leaves while still green; the foliage feeds the plant for the next season. Foliage can be cut back in the fall if desired. Cut bloom stems off at ground level after boom. 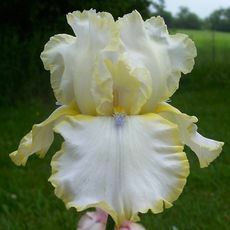 Bearded iris will thrive with a minimum of fertilizer. Do not use green manure or high-nitrogen fertilizer, which can promote soft growth that, is apt to rot. Bone meal worked into the soil before planting is good; superphosphate is another good fertilizer, or any low nitrogen fertilizer (5-10-10), applied about a month before bloom works well in the spring. Sprinkle on the ground around the plants, not on the iris rhizome itself. Water in. 1)Bacterial Soft Rot caused by excessive moisture conditions, poor drainage or too much nitrogen in the soil or fertilizer. Remove the soft portion of the rhizome with an old spoon, until you reach hard rhizome. Dust with powdered sulfur, or drench with a weak solution of bleach (9 parts water to 1 part bleach). Comet cleanser will also work because of its bleach content. Keep free from dirt and expose to air and sun to heal over. 2)Leaf Spot can occur when weather is wet and/or muggy. To combat, spray regularly with a fungicide such as used on roses about every two weeks from early spring until warm, dry weather occurs. 3)In the East and Midwest Iris Borers can be controlled by spraying with Bayer Advanced tree and shrub insect control concentrate and/or a granular product Bayer Advanced 24-hour grub control ready-to-spread, with Merit. Keeping the Iris beds clean and the naturally browning leaves picked up is the best prevention since Borer Moths lay their eggs in the dead foliage in fall and it is the larvae which hatch in the early spring and feed on the iris leaves and rhizomes. DIG AND DIVIDE iris clumps when they become over-crowed – usually after 3-4 years. Dig the entire clump with a spading fork or shovel. Cut off larger, healthy, outer rhizomes with leaves. Discard the old “mother” rhizomes. Trim leaves to about 6-10” long. Plant new divisions, as indicated above.